Instead of going for the normal Vietnamese beef noodle soup like we do every Saturday for Dot Com Pho, we decided to try something totally different by paying to cook our own food. Normally, when you go to a restaurant, the chef cooks the food for you. However, at Seven Star Pepper Szechwan Restaurant in Seattle’s International District, they have something call the Hot Pot. 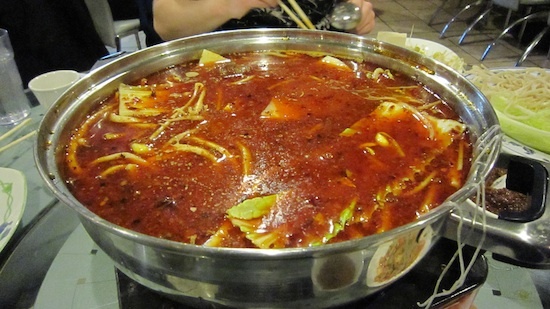 A Hot Pot, less commonly known as Chinese fondue or steamboat, refers to several East Asian varieties of stew, consisting of a simmering metal pot of stock at the center of the dining table. While the hot pot is kept simmering, ingredients are placed into the pot and are cooked at the table. The kicker is the dinners does the cooking. You have to decide what to put in the pot and how long to leave it in there for. If you under cook the chicken and get sick, that’s your problem. 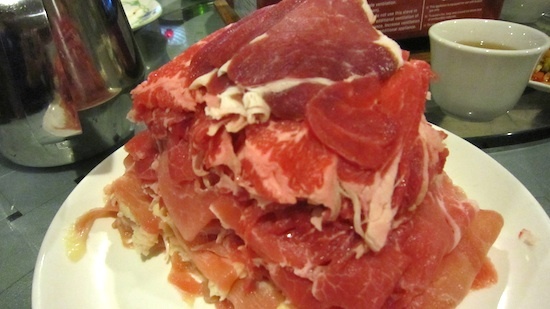 Typical hot pot dishes include thinly sliced meat, leafy vegetables, mushrooms, noodles, egg dumplings, and seafood. The cooked food is usually eaten with a dipping sauce. Seven Star Pepper gets its name from its hotness scale. While most restaurants go up to five stars in terms of heat, Seven Star Pepper adds two more to bring it to molten lava level. In addition to the Hot Pot, Seven Star offer more traditional dishes from the Szechwan aera of China, including their famous Szechwan crab. We were actually there for the crab but it was sold out so we went for the Hot Pot instead. We’ll have to try the crab next time. 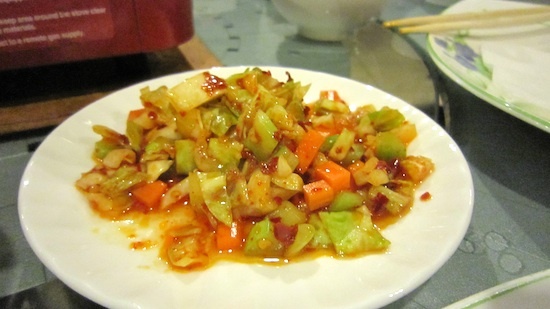 The key to a goot Hot Pot is the soup base and base used at Seven Star Pepper is among the best I’ve tried. The soup base was very spicy but you can tame some of the hotness by using the included peanut sauce. If burning up your insides isn’t your thing, Seven Star can make a normal non-spicy soup base but the server will look at you funny and call you a sissy in Chinese. Joining me for this Dot Com outing were the boys from Unique Blog Designs. It was their first time trying Hot Pot and I doubt it will be their last. If you like the idea of paying to cook your own food, then head on down the Seven Star Pepper and give their Hot Pot a try. Just remember to order lots of beer if you go for their seven star soup base.